ST. JOSEPH – For people with disabilities, voting is another task that requires a little extra help to accomplish – depending on the option they choose. One of those options is AutoMARK, a new type of voting machine that took center stage Tuesday at the St. Joseph Library during an hourlong workshop on disability and voting rights. St. Joseph Township Clerk Denise Cook shows Stevensville resident Emily Kowerduck how to begin voting on the AutoMARK, a machine that eases the process for people with disabilities who need help at the polls. Stevensville resident Emily Kowerduck likes what she saw, once St. Joseph Township Clerk Denise Cook finished walked her through the finer points of using AutoMARK, which Cook said under federal law must be made available to voters who request it. “I liked that it talked to you, and you really don’t have to have somebody (helping at the polls),” said Emily, who has cerebral palsy, as well as hearing impairments. “You won’t need me anymore – just a car to drive you there,” agreed Emily’s father, Jeff Kowerduck, who has helped her vote in the past. That help is mostly limited to making sure that Emily casts an accurate ballot. “It’s just to keep her on track, to make sure that she votes for the proper number of people, and ask if she’s got any questions – because she’s a great reader,” Jeff said. 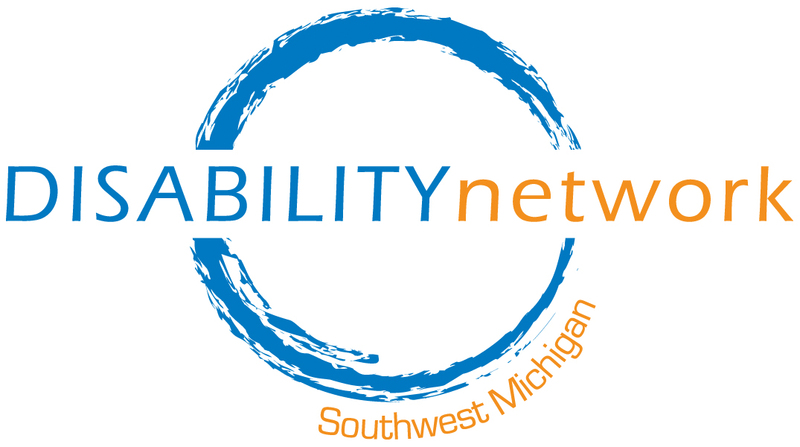 Tuesday’s demonstration closed a workshop on disability and voting rights, which St. Joseph Township and the Disability Network of Southwest Michigan co-sponsored. Eight people attended. Joanne Johnson, a community educator and systems advocate for the Disability Network, served as moderator, while St. Joseph Township Clerk Denise Cook was the featured speaker. “It’s important for people to know all the options for voting, and all the different ways that we can cast our ballots. A lot of times, choice gets taken away from people with disabilities,” Johnson said. 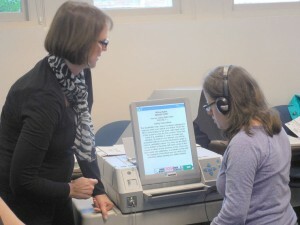 For example, voters with disabilities sometimes use machines that aren’t well-designed, she said. AutoMARK’s versatility definitely broadens the options for voters with disabilities – who can push buttons to adjust volume, or change the background of a ballot text so it’s easier to read, Cook said. AutoMARK also reduces the risk of errors, because “it doesn’t allow you to over-vote,” she said. For example, if users don’t follow instructions – such as choosing only two candidates – AutoMARK will say, “You voted for one person,” and ask the voter to correct the issue. People with disabilities can also use more traditional ways to make their votes count, Cook said. One of the more popular options is requesting an absentee ballot – which people can do, if they’ll be out of town on election day, or can’t vote without assistance, Cook said. Both scenarios are among six specific reasons that Michigan allows for requesting an absentee ballot. State Rep. Lisa Posthumus Lyons has introduced a bill that would allow voters to request an absentee ballot for any reasos, though it hasn’t made it out of committee in the state House. That information also came as a surprise to Syreeta Cheathom of St. Joseph, who tends to vote absentee because she’s often traveling out of the country around Election Day. “That’s very interesting – I’d like to see somebody actually utilize that, because there are many people who don’t realize it until it’s time to vote. They don’t know that it’s available,” she said. Cheathom plans on reporting back what she heard Tuesday to her fellow parishioners at Union Memorial AME Church. “We have quite a few seniors that are not sure (if) they’re getting absentee ballots. We want to ensure they know the various options for voting,” she said. Ben Schindler of Stevensville found the information relevant on a personal level, since he’s a standby guardian for a friend. A second workshop is scheduled at 2 p.m. Tuesday, Sept. 22, at Niles District Library, 620 E. Main St., Niles. Lunch won’t be served, so preregistration isn’t necessary, Johnson said. For more information, visit www.dnswm.org.